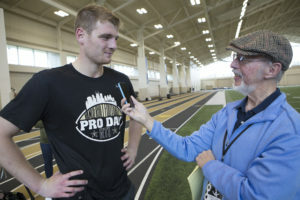 I had an opportunity recently to meet former Vanderbilt quarterback Kyle Shurmur and discuss his potential future in the National Football League. You can read my story about Kyle in the Nashville Ledger. It was fun talking with him — and with others about the record-setting Vandt quarterback. I think he’s going to get an opportunity to someday excel at the next level. There’s no doubt Kyle has the size and the smarts to play in the NFL. He’s 6-foot-4 and 230 pounds, and he graduated from Vanderbilt in 3-1/2 years with a degree in economics. But the question marks he has to answer concern his speed and arm strength. 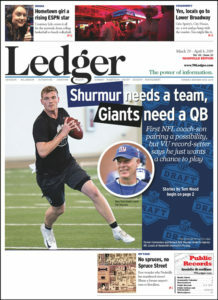 “I’d appreciate any opportunity I get,” Shurmur told me after he and his draft-eligible teammates completed Vanderbilt’s recent Pro Day workouts in front on more than 50 scouts from 30 NFL teams and one from the Canadian Football League. The NFL Draft that will be held in the streets of downtown Nashville April 25-27 is arguably the biggest event Music City has ever hosted. Certainly the biggest sporting event and perhaps even larger than the annual CMA Music Festival. While most pre-draft coverage has focused on the biggest stars of the sport, Shurmur has gotten his fair amount of looks — from the scouts as well as the media. Part of it is because of his record-breaking career at Vandy, but some of it is also because his father Pat is the head coach of the New York Giants. Could Kyle someday be playing for his father? Against him? Will the Giants draft him in the latter rounds if he hasn’t been selected by another team? My opinion, for what it’s worth, is that Shurmur certainly would get a shot at the NFL because it is merited on his stats. He has the size, the smarts and the heart to play on Sundays. Will he ever be a starter in the NFL? Only time will tell. CONGRATS TO LIPSCOMB BASKETBALL: Win or lose in Thursday’s (April 4) National Invitation Tournament championship game, kudos to coach Casey Alexander and the Lipscomb University men’s basketball team. The Bisons will meet Texas for the NIT crown at Madison Square Garden. No longer as prestigious as the NCAA Championship, winning the NIT title would nevertheless be a high point for Lipscomb, which won an NAIA championship in 1986. I covered Alexander when he was a spitfire guard for Belmont, and have covered Lipscomb games the past few years when they hosted Florida Gulf Coast in the Atlantic-Sun Conference showdowns. Casey’s teams have gotten stronger each year he’s been at the school, earning their first NCAA Tournament berth a year ago. The Bisons just missed returning to the NCAA field this season, falling to Liberty in the A-Sun tourney title game. But despite that setback, this season has proven to be a pinnacle of success for the Bisons. Reaching the NIT semifinals was tough — winning three road games in the state of North Carolina, the cradle of college basketball. The Bisons overcame Davidson, UNC Greensboro and N.C. State to advance to Tuesday night’s NIT semifinal. In that game, the Bisons had to overcome an 11-point deficit in the final eight minutes and held Wichita State scoreless the last 3-1/2 minutes to seal the victory. And now Texas. A David vs. Goliath matchup in terms of national perception of the progams. BELMONT COACH BYRD RETIRES: I’ll never forget a conversation I had with retiring Belmont Bruins basketball coach Rick Byrd back in the mid-1990s when the school had reached the NAIA semifinals for the second consecutive year, and had announced plan to move up to the NCAA Division I level. I remember telling coach Byrd that his team would never again play for a national championship. His teams proved me wrong eight time during his tenure, reaching the NCAA round of 64 and therefore being eligible to play for the NCAA crown. This season, the Bruins got their first NCAA Tournament victory, beating Temple 81-70 in the First Four before losing to Maryland 79-77 in the first round. It was a heck of a ride and the perfect way for Rick to end his remarkable coaching career. So congratulations to one of the best coaches I ever had the pleasure to write about. UPCOMING EVENTS: I will be appearing at the Main Street Festival in Franklin with number of local authors April 27-28. You can also get a copy of Vendetta Stone at Mill Creek Mercantile in Donelson, or order one at Parnassus. Kudos to Franklin author Bill Peach for organizing the June 1-2 Authors Circle Franklin Book Festival at Williamson County Library. More than 40 Nashville-area authors — and even a few outside the area — will be participating in panel discussions and meet-and-greets with the public. I will be hosting a panel on Saturday at 2 p.m. to discuss anthologies with Michael J. Tucker, Kathy Rhodes, Bill Woods and Catherine Moore. We’re working on one that will be out later this year. Go to my page on Facebook — Tom Wood – Vendetta Stone — for more information. And as always … thanks for reading. 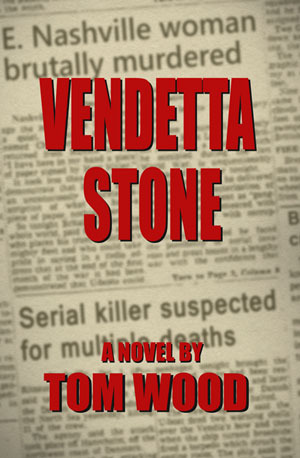 Tom, I have been reading Vendetta Stone with delight and can hardly put it down. Thank you for an exciting thriller. I don’t normally write authors about mistakes or typos I come across but I did catch James Michener in one in Centennial where he mentions The Old Rugged Cross being one of the hymns sung at an early camp meeting years before George Bennard (1873-1958) wrote it. That all goes to say, I’ve found only one typo so far in Vendetta. (p. 257, 4th paragraph – “…what I in mind…” needs to be “what I had in mind.” A very minor omission which you’ve probably caught already. Sharp eye, John. I’ll have to double-check if I caught that one. Glad you’re enjoying Vendetta Stone. The sequel is targeted for a spring launch. Read your first book. Looking forward to the second. Hey, thanks Linda. It’s looking promising and is picking up steam. It was great to meet you Tom at the Southern Festival of Books!